Physical therapists vs. acupuncturists: Who’s sticking it to whom? Beverly physical therapist Andy McLlarky performed a dry needling treatment on a patient with back and hip pain. Andy McLlarky, a physical therapist in Beverly, was torn. As the co-owner of Soul Physical Therapy, he wanted media attention for a pain treatment he’s started using successfully with patients. But he was worried, too, and when a reporter contacted him about the new therapy, he briefly hesitated. “I don’t really want to make myself a target,” he wrote in an e-mail to the Globe. Who was he afraid of? Acupuncturists. Look out! In Massachusetts and across the country, acupuncturists and physical therapists are fighting over who has the right to stick slender filiform needles into patients. The battle over dry needling, as the therapy is called, is taking place in courthouses and state houses. As the use of alternative therapies grows, big money is at stake, and acupuncturists are trying to protect their turf. Acupuncture was once a fringe treatment in the United States, scorned by the medical establishment as well as by mainstream patients. But in 2012, Americans spent $14.7 billion out-of-pocket on therapies like acupuncture, massage, and chiropractic care, according to the National Center for Complementary and Integrative Health. And recognition is building. In 2017, for example, the American College of Physicians issued a guideline recommending that physicians and patients treat acute or subacute low back pain with nondrug therapies such as superficial heat, massage, acupuncture, or spinal manipulation. The good news for acupuncturists is that a growing number of health insurers are covering their treatments, which run about $65 to $85 per hour. But there’s bad news, too: Despite increasing recognition, physical therapy is still covered by more plans than acupuncture. In practical terms, that means a patient who gets dry needling as part of a larger physical therapy visit may pay nothing or just a co-pay. That presents a big threat to acupuncturists. With their business interests threatened, the acupuncturists are trying to make the case, to licensing boards, lawmakers, and the public, that their rivals are performing unlicensed acupuncture under a Western-sounding name. But the physical therapists insist that while the needle is the same, the therapy is different. To bolster their case, the acupuncturists say their concern is about patient safety and consumer protection. Amy Mager, secretary of the Acupuncture Society of Massachusetts and vice chairwoman of the American Society of Acupuncturists, says physical therapists are performing “unregulated and unlicensed acupuncture” with scant training. She points to the thousands of hours of education required to get an acupuncturist license. But James P. Leahy, executive director of the American Physical Therapy Association of Massachusetts, disputes the notion that physical therapists are not qualified. “PTs’ education provides an in-depth understanding of anatomy, physiology, neuroscience, and the integumentary system necessary to perform this work,” he e-mailed the Globe. “Acupuncture is based on ancient Chinese medicine and the concept of balance and restoring proper flow of energy throughout the body,” he added, whereas physical therapists insert the needles to break up muscle knots and release muscular tension. With all the professional bickering, patients can be forgiven for wondering what, exactly, is the difference between dry needling and acupuncture. Stephen Cina, an assistant professor of acupuncture at MCPHS, formerly the Massachusetts College of Pharmacy and Health Sciences, said that an onlooker would not be able to distinguish dry needling from acupuncture. The difference, he said, is that dry needling targets trigger points to treat muscle pain, while acupuncture treats not only muscle pain but many other symptoms. Leahy, of the physical therapy association, says he hasn’t seen physical therapists treating anything but muscle pain. 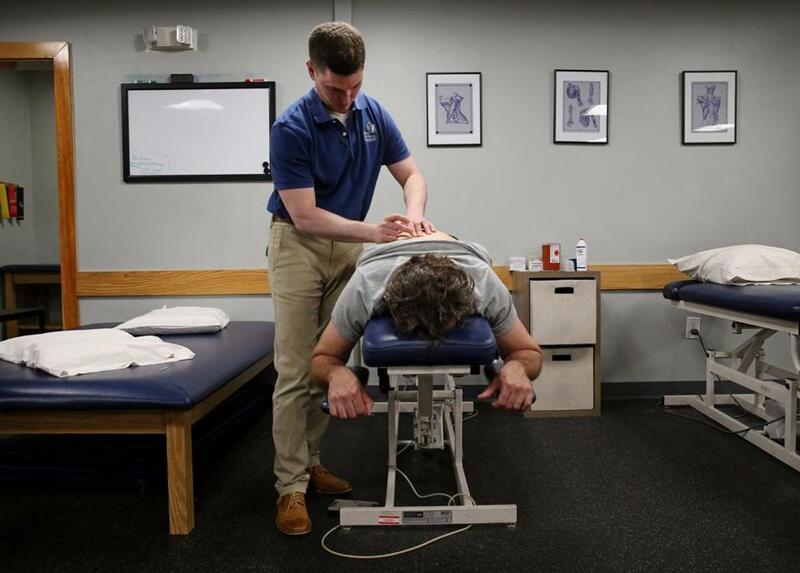 As matters now stand in Massachusetts, physical therapists are neither explicitly allowed nor prohibited from dry needling, a gray area that’s led to a growth in the number of physical therapists offering dry needling services. With increased interest in non-opioid treatments for pain, and big money at stake, the sides are divided — except over one issue: If the other side gets its way, each profession says, it’s the patients who will suffer. “I was at a bar mitzvah, and a woman came up to me crying because she’d seen a physical therapist for tennis elbow, and that person gave her dry needling and she has nerve damage,” said Mager. David Fishkin, founder of the Maryland-based Dry Needling Institute, says acupuncturists are preventing people from getting needed therapy. The state acupuncture society is fighting dry needling on two fronts, or, more accurately, trying to. The group got a bill filed in the Legislature that would effectively prevent physical therapists from dry needling, but it’s “languishing,” said Linda Robinson-Hidas, president of the group. The group has petitioned the Board of Registration in Allied Health Professionals, a licensing body, to effectively take dry needling away from those without acupuncture licenses, but Mager says she has not gotten a formal response. The American Physical Therapy Association of Massachusetts doesn’t know how many practices are offering dry needling, but it says the therapy is becoming more popular. The Brigham and Women’s Hospital’s rehabilitation center in Foxborough offers dry needling. So does physical therapist Ed Lacerte, a former Celtics head athletic trainer, who runs Pro Sports Therapy practices in Westford and Waltham. He used the therapy on Celtics players, too, to relieve muscle spasms and muscle tension. Interest in dry needling has spawned a whole industry. Out-of-state firms, like Fishkin’s Dry Needling Institute, are coming to the area to offer courses for physical therapists who want to get into the practice. KinetaCore, of Louisville, Ky., says it will be in Pawtucket, R.I., in mid-July with a two-day Functional Dry Needling Level 2 course. An August course in Boston, offered by yet another firm, Integrative Dry Needling Institute of Ohio — has already sold out. Acupuncturists are on alert. On its website, the American Society of Acupuncturists has an interactive legislative map devoted to dry needling fights across the country. It’s fair to say that the acupuncturists have their work cut out for them. According to Mager, in eight states, physical therapists (and others) are prohibited from doing dry needling. They’re allowed to do it in 16 states, with the battles in the rest still to come. Back in Beverly, McLlarky, the physical therapist, said he understands the acupuncturists’ unhappiness, and he knows it’s a bad look when healers battle.